It might seem daft, given how many socks I knit, but for a long time I’ve avoided knitting hats. There were lots of things about hat knitting that made me quite anxious. The first hurdle is the cast on. A hat needs a stretchy cast on, and most patterns recommend a long tail cast on. Apart from the fact that I find it very fiddly to do, there’s the issue of having to estimate how much yarn to use for the tail. Frankly, it just feels like something waiting to go wrong. Then there’s tension/gauge. I realised a long time ago that I knit with a slightly loose tension, and I usually go down a needle size when knitting shawls and cardigans. It’s only through knitting seamless jumpers and cardigans that I’ve realised that while I need to go down a needle size when knitting flat, my tension is actually a bit tighter when knitting in the round. I’ve finally figured out that when I do the sleeves on a cardigan, I need to go back up to the needle size given in the pattern otherwise my sleeves are too tight. When I started knitting socks, I’d done very little knitting in the round. I quite quickly settled on a needle size I liked (2.25 mm), then worked out how many stitches worked well for my foot. As most sock patterns recommend a 2.5 mm needle, I’d mistakenly thought this meant I should go down a needle size when knitting in the round. Finally, there’s my head, as in I have a big head. Most patterns for women’s hats are for a 22″ head, but my head is 24″. I’d like to put that down to my massive brain, but I suspect it has more to do with my very thick hair! This means I either have to start messing around with bigger needles (will I have enough yarn? ), or messing with the pattern (will it be too big and will I have enough yarn?). Or I have to find a pattern that includes men’s sizes. I remember when I was younger, going shopping with friends, and whenever we tried on hats, they were always too tight on me. I finally bit the bullet and knitted a hat because a friend asked me to knit a hat for her husband. 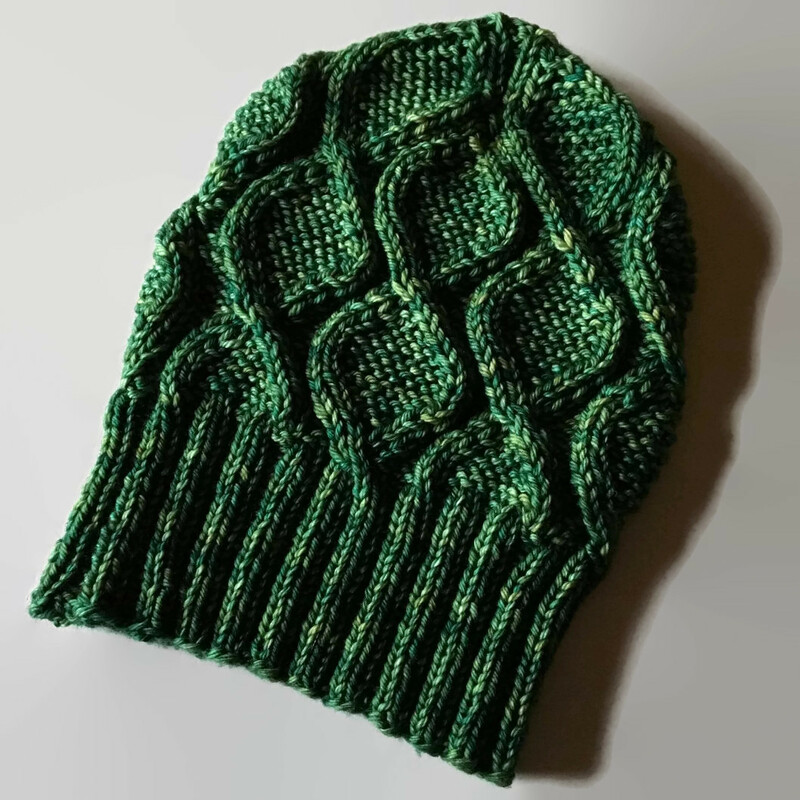 I was humming and hawing over patterns, when I saw a photo of the Clever Cables hat on Instagram. 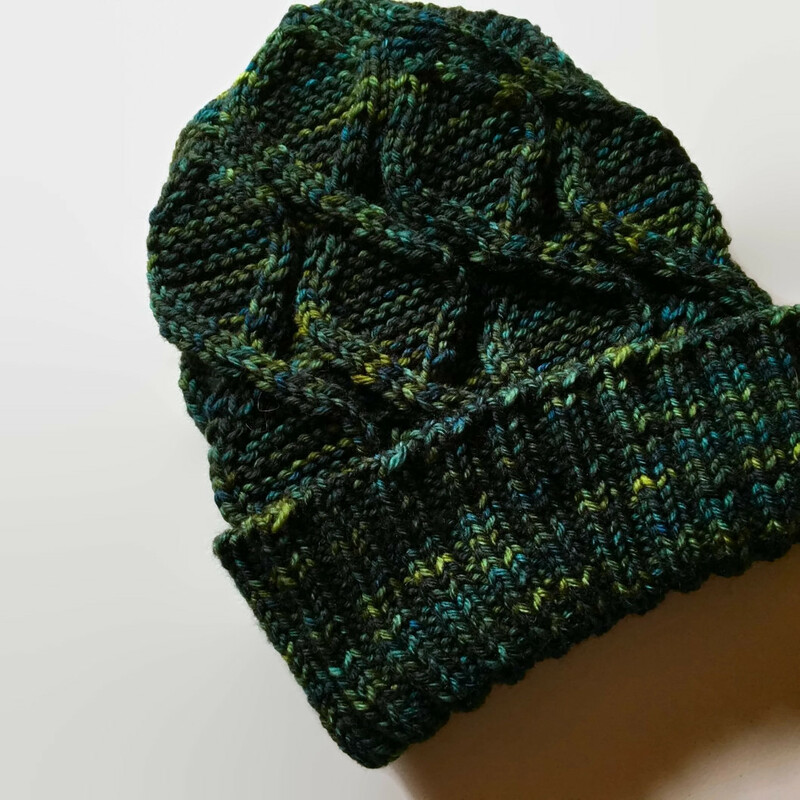 This hat combined a couple of my favourite knitting elements, curvy cables and squishy garter stitch. Better still, it turned out to be by Susan Ashcroft, one of my favourite designers. I ordered a couple of skeins of Malabrigo Rios to give Bill a choice of colours, and I was good to go. I knitted Bill’s hat first. He’d decided on the lighter green (Fresco Y Seco). I used a long tail cast on, but used the other end of the ball for the tail, so I didn’t have to estimate how much yarn I needed for the tail. On the downside, the tail yarn, untwists as you cast on, plus once you snip your tail yarn, you have extra ends to weave in – never a good thing in my book. I used Eastern purls throughout. It wasn’t strictly necessary to use them in the middle of the garter stitch sections, but it seemed much simpler just to be consistent. I knit the hat with a 3″ brim, as per the pattern. Bill wanted a hat to keep the top of his head warm, and something snug enough to stop his glasses slipping down when he’s walking. I was really pleased with the end result. 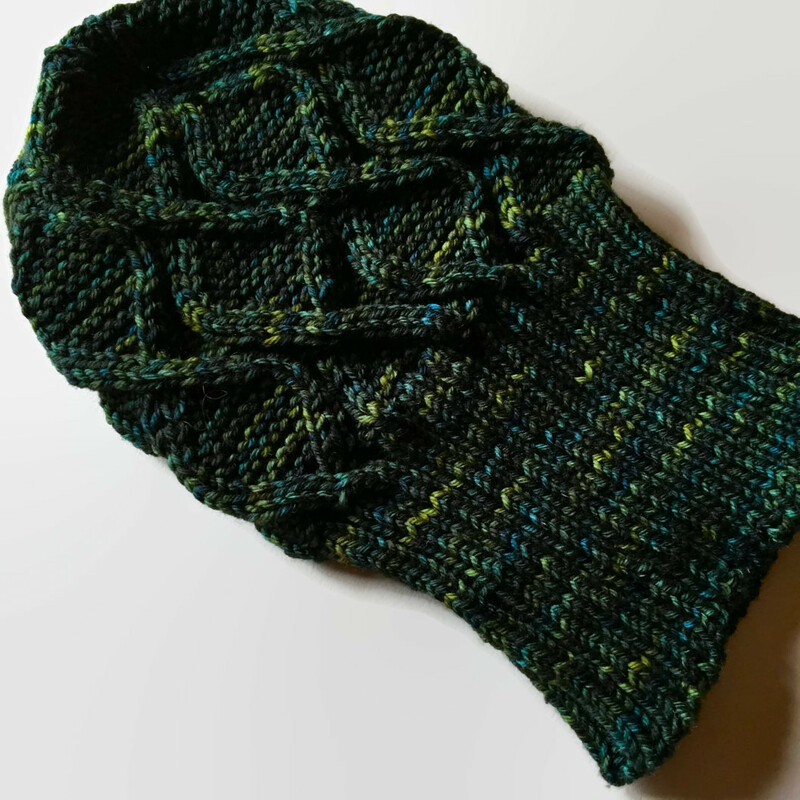 I was so pleased, I decided to knit another one for myself, using the second skein of darker green (Vaa). This time, I used the Alternate Cast On for 2×2 Ribbing. I’d come across this tutorial when looking at hat patterns; it was referenced in someone’s project notes. I didn’t use it for Bill’s hat as this method leaves you set up for k2, p2 rib, and this pattern has you knit p2, k2 rib. It was only when I was halfway up the brim that it occurred to me that all I needed to do was move my End Of Round marker up 2 stitches! I’ve been using a cable cast on ever since I learned how to knit (long before I knew what it was called), so this method of casting on for ribbing really suits me. There’s no guesswork involved, and I only had one end to sew in; it was perfect. It was as stretchy as the long tail cast on I’d used in the first hat. I worked a longer brim on my hat (5″). I get horrible earache when it’s windy, so I wanted an extra thick layer over my ears. Keeping my ears protected is the main reason I wear a hat at all. As I’d used just 2/3 of a skein for Bill’s hat, I reckoned I could make the brim quite a bit longer and not end up playing yarn chicken. In the end, I used 80g of yarn in my hat. Overall, I’m really pleased with both hats. I loved how quickly they knit up – it’s as close to instant gratification as you can get in knitting. I’m delighted that I’ve found an alternative to the dreaded long tail cast on. I might even have a go at some cuff down socks, now I’ve found a stretchy cast on that I like! (Yes, fear of the long tail cast on is what prompted me to look at toe up socks, it frightens me far more than kitchener stitch on the toes.) 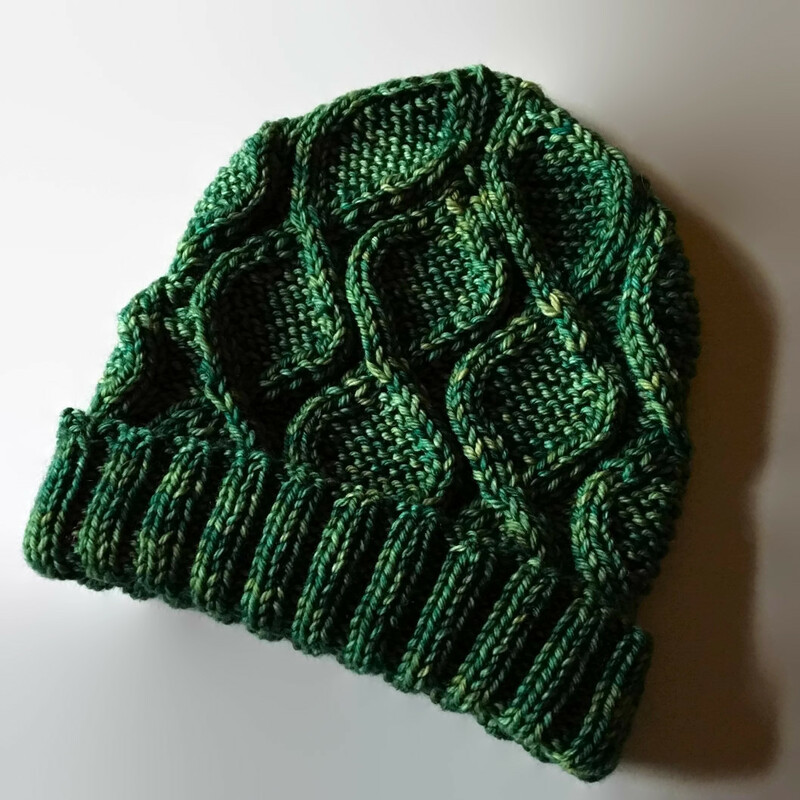 I will definitely be knitting more hats in the future.